33 Gloucester is located on the east side of Gloucester, between Commonwealth and Newbury, with 31 Gloucester to the north and 35 Gloucester (279 Newbury) to the south. 33 Gloucester was designed by architect Samuel D. Kelley and built in 1882-1883 by Samuel Tarbell Ames, builder, for Charles Anthony Morss, a wire and cable manufacturer. It was one of four contiguous houses (29-31-33 Gloucester and 279 Newbury) built for Charles Morss for speculative sale. He and his wife, Mary Elizabeth (Wells) Morss , lived at 323 Marlborough. Charles Morss is shown as the owner on the original building permit applications for all four houses, dated April 18, 1882. He purchased the land for the houses on April 1, 1882, from Susan (Susie) A. (Davies) Braman, the wife of Grenville Temple Winthrop Braman, former treasurer of the Boston Water Power Company. The land had changed hands several times and was part of a parcel previously owned by Nathan Matthews, part of an even larger tract he had purchased on January 2, 1871, from David Sears, Jr., Frederick R. Sears, and Knyvet Sears. Click here for an index to the deeds for 33 Gloucester. When the completed houses at 29-31-33 Gloucester were sold by Charles Morss, he included a 3 foot 6 inch easement at the rear of 29-31 Gloucester to provide access to the alley for all three houses. On January 22, 1883, 33 Gloucester was purchased from Charles Morss by Martha (Sprague) Elkins, the wife of banker Richard Gardner Elkins. They previously had lived in West Newton. 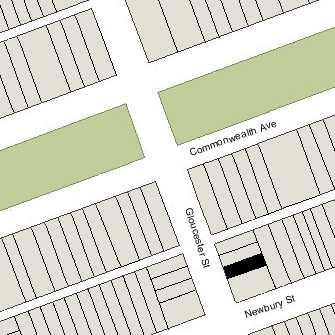 They lived there during the 1883-1884 winter season, but moved thereafter and by 1885 were living in West Newton again. On July 26, 1884, 33 Gloucester was purchased from Martha Elkins by Caroline (Carrie) Ann (Lodge) Sawyer, the wife of Arthur Wilkinson Sawyer. They previously had lived at 167 West Brookline. Arthur Sawyer was associated with the woolen manufacturing and wholesale dry goods business owned by his father, Joseph Sawyer. By the late 1880s, he had become an investment banker and broker. The Sawyers continued to live at 33 Gloucester during the 1889-1890 winter season, but moved thereafter to 91 Newbury. On August 28, 1890, 33 Gloucester was purchased from Carrie Sawyer by Emily Jane (Andrews) Jackson, the widow of Dr. John Barnard Swett Jackson, who had been a physician and professor of morbid anatomy at Harvard Medical School. She previously had lived at 89 Charles. Her son and daughter-in-law, Robert Tracy Jackson and Fanny Esther (Roberts), lived with her. Robert Jackson was a paleontologist. They continued to live at 33 Gloucester during the 1899-1900 winter season, but moved thereafter to Cambridge. Emily Jackson died in October of 1906. In her will, she left all of her property, including 33 Gloucester, to her two sons, Robert and Henry. Henry Jackson was a physician. He and his wife, Lucy (Rice) Jackson, lived at 309 Marlborough. By the 1907-1908 winter season, 33 Gloucester was the home of Dr. William Lothrop Edwards, a physician, and his wife, Alice (Loring) Edwards. They previously had lived at 145 Beacon. They continued to live at 33 Gloucester during the 1921-1922 season, but moved thereafter to 15 Hereford. On September 29, 1922, 33 Gloucester was purchased from Robert and Henry Jackson by Nora Bartley (Kent) White, the estranged wife of investment banker Harry Kent White. She also maintained a home in Annisquam. She previously had lived at The Abbotsford at 186 Commonwealth. Prior to their legal separation in 1922, she and her husband had lived at 393 Marlborough and maintained a home in Pepperell. 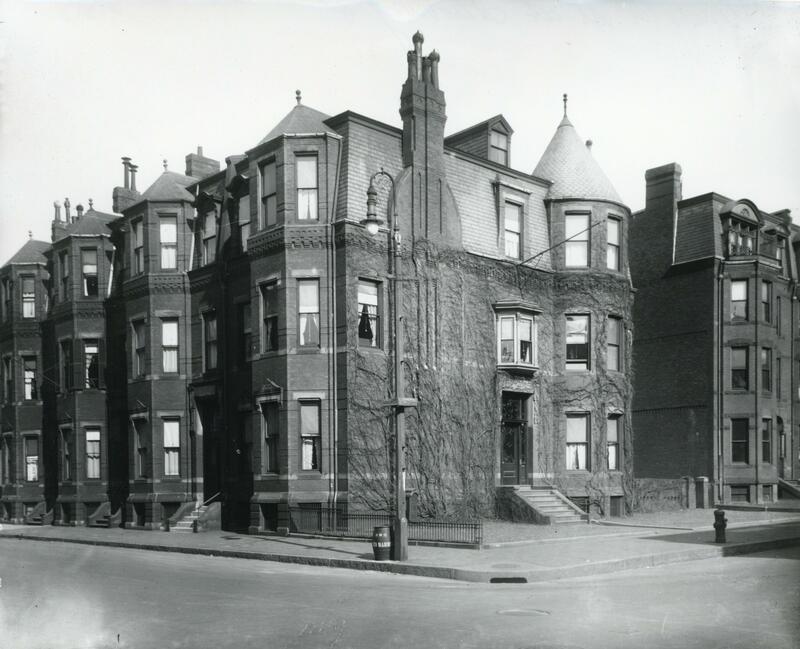 On October 20, 1925, she transferred 33 Gloucester to her three children: Louise Lawrence White, who lived in Rye, New York, and Henry Kent White and Harriet Farnham White, who lived with her at 33 Gloucester. Henry White, a bank officer, married in November of 1935 to Priscilla Colt of Pittsfield. After their marriage, they lived in an apartment at 250 Beacon. Harriet White married in October of 1937 to Stephen Brace Hibbard. After their marriage, they lived in an apartment at 20 Fairfield. Nora White continued to live at 33 Gloucester until about 1947. On September 25, 1947, 33 Gloucester was purchased from Henry White, Harriet (White) Hibbard, and Louise White by real estate dealer Thomas J. Diab. By 1948, 33 Gloucester was the home of Maurice B. Lynch, a lawyer, and his sister, Maude A. Lynch, a kindergarten teacher. They had lived at 45 Hereford in 1947. Maude Lynch died in March of 1949. 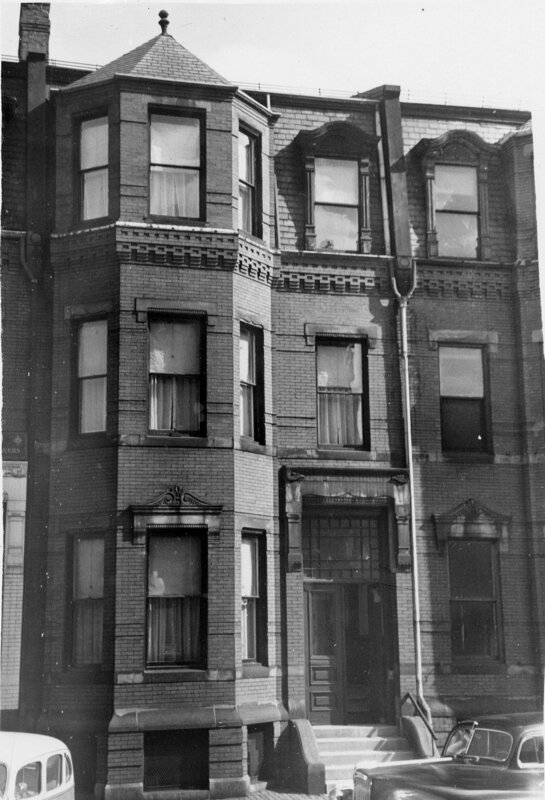 Maurice Lynch continued to live at 33 Gloucester until his death in January of 1955. On April 20, 1955, 33 Gloucester was purchased from Thomas Diab by real estate dealers Stuart H. Hastings and Joseph A. Gautreau. That same month, Stuart Hastings applied for (and subsequently received) permission to convert the property from a single-family dwelling into eight apartments. The property changed hands and on May 29, 1959, was acquired by Leo Simon, Harold Simon, and Arthur M. Simon, trustees of the Nomis Realty Trust. They leased the property to Robert O. Tillinghast, who owned 29 Gloucester and 278–280 Commonwealth. In July of 1961, Nomis Realty filed for (and subsequently received) permission to convert the property from eight apartments into a lodging house, and in April of 1962, it filed for (and subsequently received) permission to convert the property into a dormitory for use by Burdett College. On October 23, 1962, 33 Gloucester was purchased from Nomis Realty by Michael J. Smith, Inc.
On July 15, 1963, 33 Gloucester was acquired from The Wethersfield Corporation (formerly Michael J. Smith Inc.) by Morton L. Bardfield and Martin B. Hoffman, trustees of the Bardfield-Hoffman Realty Trust. 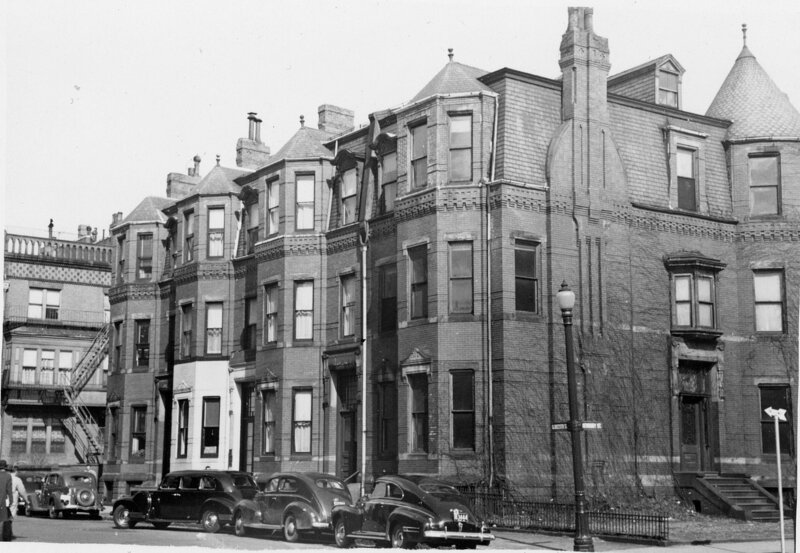 In December of 1966, the trust applied for (and subsequently received) permission to convert the property back into eight apartments. On February 9, 1967, 33 Gloucester was acquired from the Bardfield-Hoffman Realty Trust by Robert E. Santino, and on January 31, 1977 it was acquired from him by Peter Kakoulidis. In February of 1982, Peter Kakoulidis applied for (and subsequently received) permission to convert the property from eight apartments into seven apartments and one retail store. The property changed hands and on October 24, 1984, was purchased by Suzanne Safar, trustee of the Gaston-Serge Realty Trust. 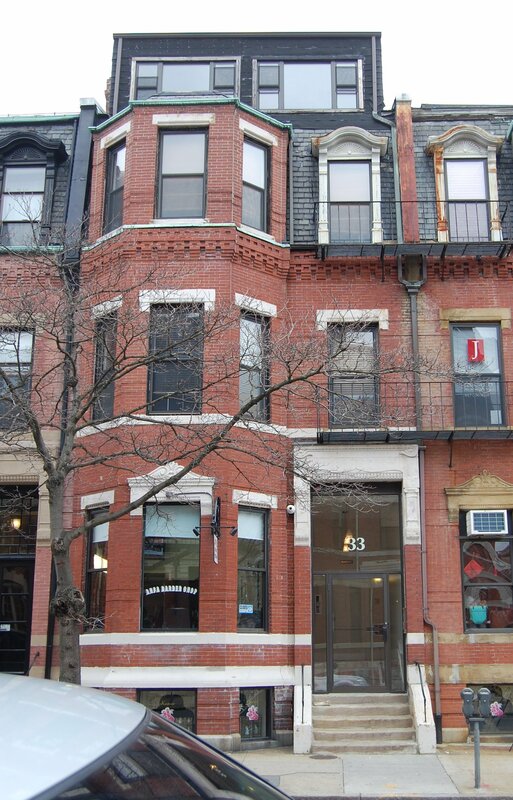 In November of 1979, she had acquired 279 Newbury (35 Gloucester). 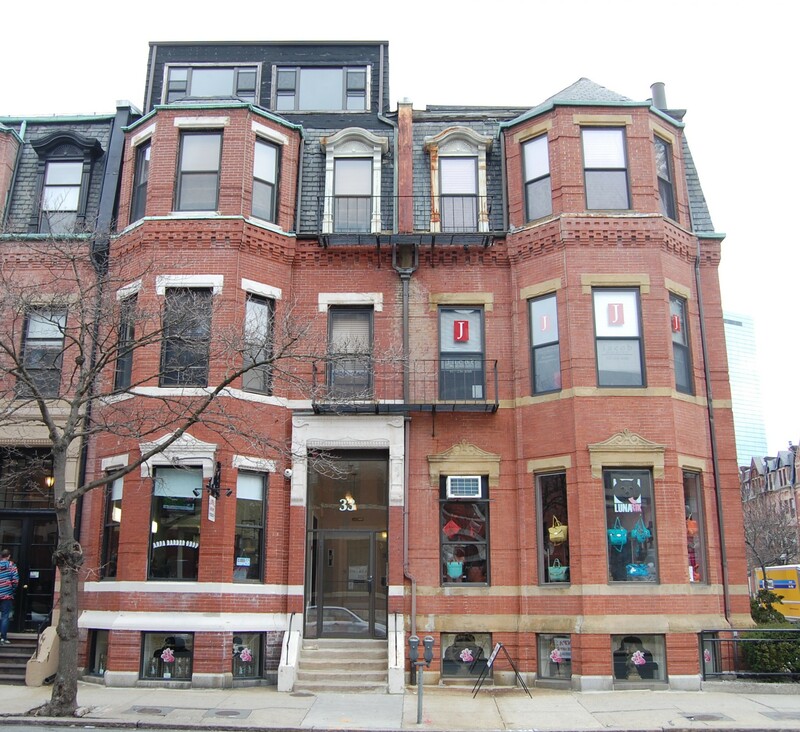 In December of 1985, the Gaston Serge Realty Trust filed for (and subsequently received) permission to combine 33 Gloucester and 279 Newbury into one property. The properties were occupied as a combination of apartments, retail stores, and restaurants. 33 Gloucester and 279 Newbury remained a mixed residential and commercial building in 2017.